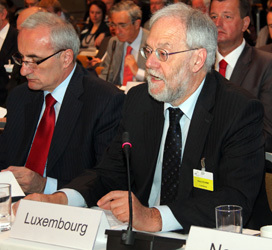 IISD Reporting Services (IISD RS) has produced web coverage and a summary report from this meeting. To download our report click below in the HTML or PDF icons. 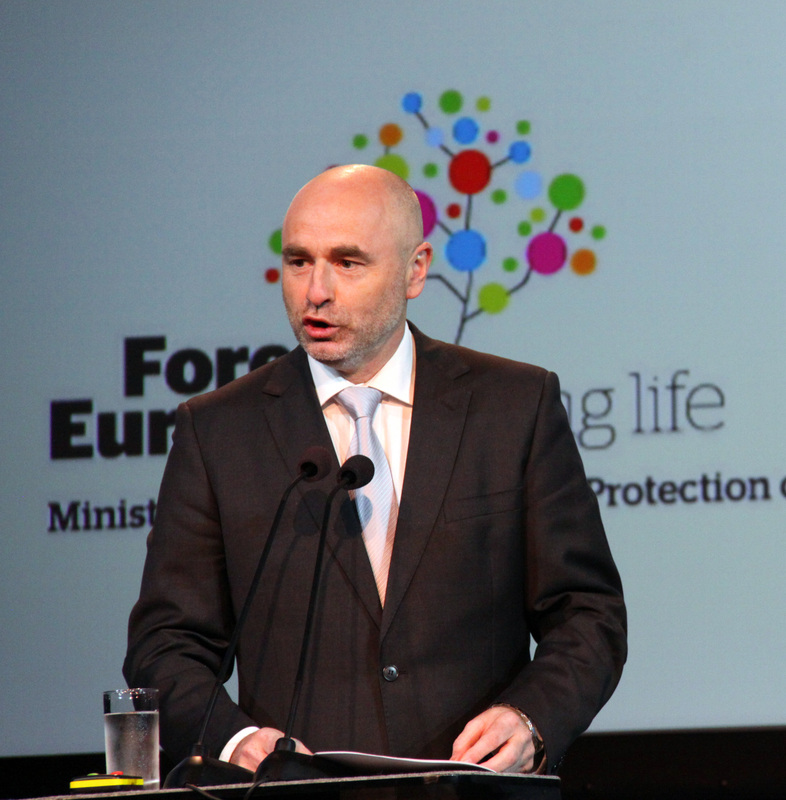 On the second day of the FOREST EUROPE Ministerial Conference, delegates heard statements from signatory countries, intergovernmental organizations and observer countries. 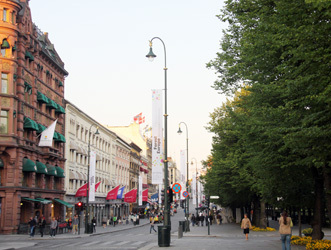 Signatory states then adopted the Oslo Ministerial Mandate for Negotiating a Legally Binding Agreement on Forests in Europe, and the Oslo Ministerial Decision: European Forests 2020, which outlines a vision, goals, targets and actions for European forests. A signing ceremony was then held, during which Ministers and Heads of Delegation of the Signatory States signed the newly-adopted documents. 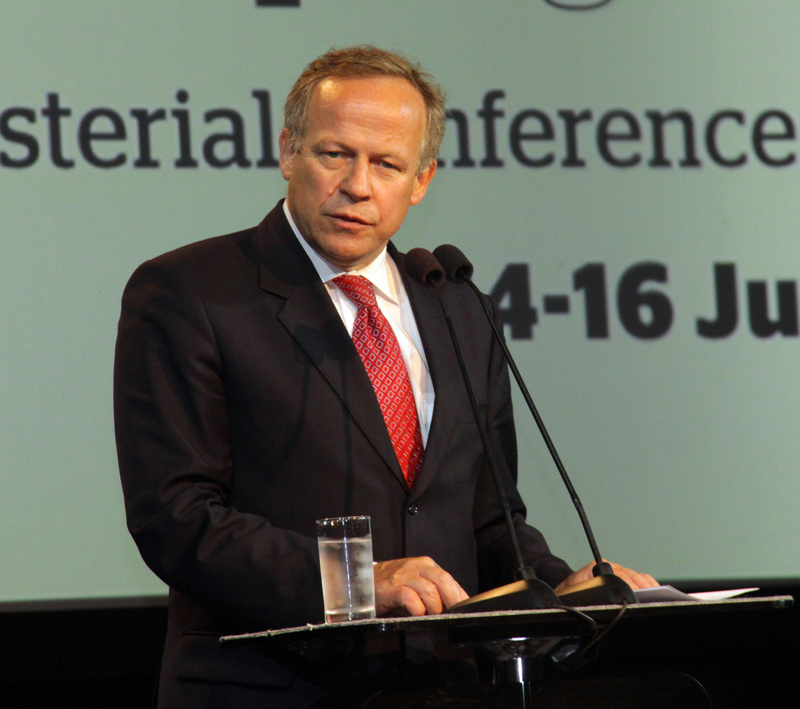 Co-Chair Lars Peder Brekk, Norwegian Minister of Agriculture and Food, invited Turkey to replace Poland on the General Coordinating Committee, which has the task of facilitating and coordinating the work of FOREST EUROPE. 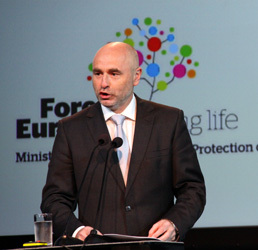 Janusz Zaleski, Undersecretary of the State, Ministry of the Environment, Poland, expressed gratitude to the countries for their cooperation during all activities. 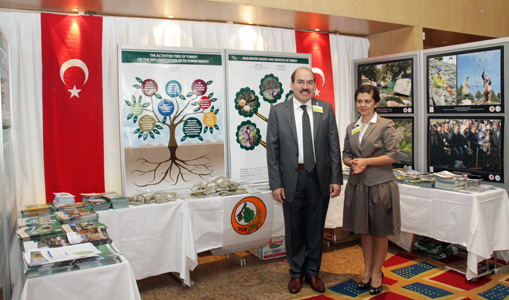 Mustafa Kurtulmuslu, Director General of Forestry, Ministry of Environment and Forestry, Turkey, accepted the invitation on behalf of his country. Co-Chair Brekk then passed the chairmanship of FOREST EUROPE to Spain. 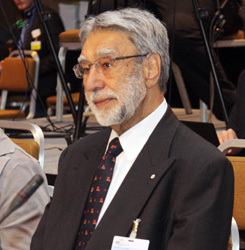 He lauded the successful achievements of the Ministerial Conference, saying it has contributed significantly to forest sustainability, and left participants with three messages, to: enter negotiations with an open mind; focus on the future and future role of forests; and not forget about the need for increased international cooperation. Co-Chair Brekk gaveled the meeting to a close at 3:16pm. 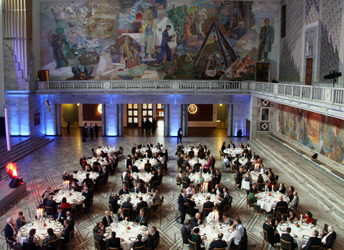 IISD RS will be producing a summary of the Conference on Saturday, 18 June 2011. Co-Chair Brekk gavelled the meeting to a close at 3:16pm. 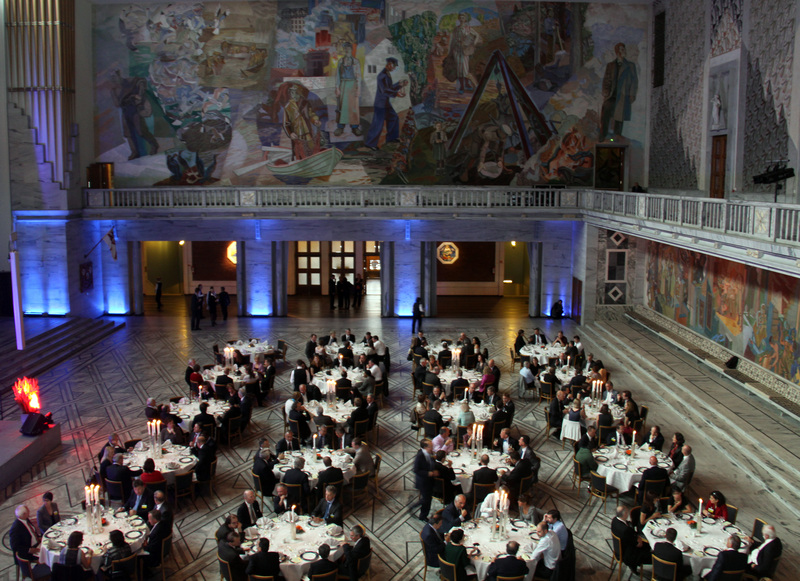 Reception at the Oslo City Hall hosted by the governments of Norway and Spain. 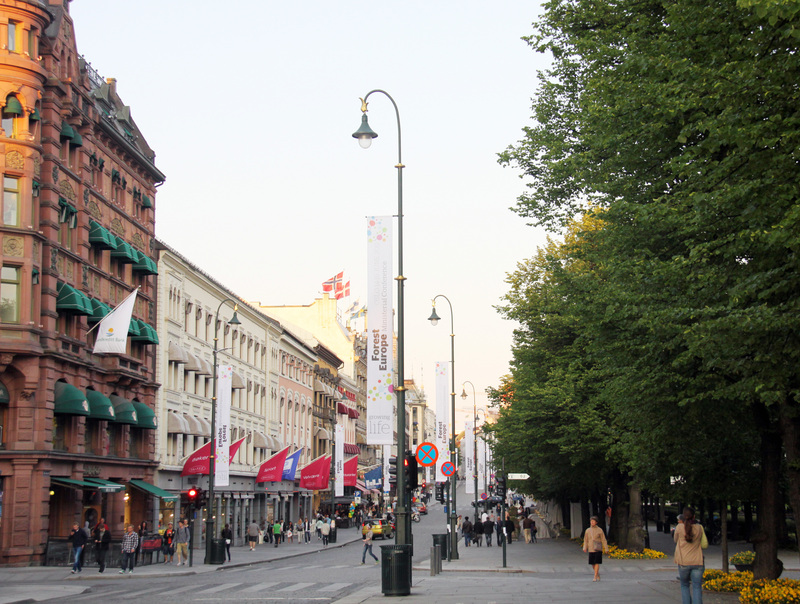 Forest Europe banners around downtown Oslo. 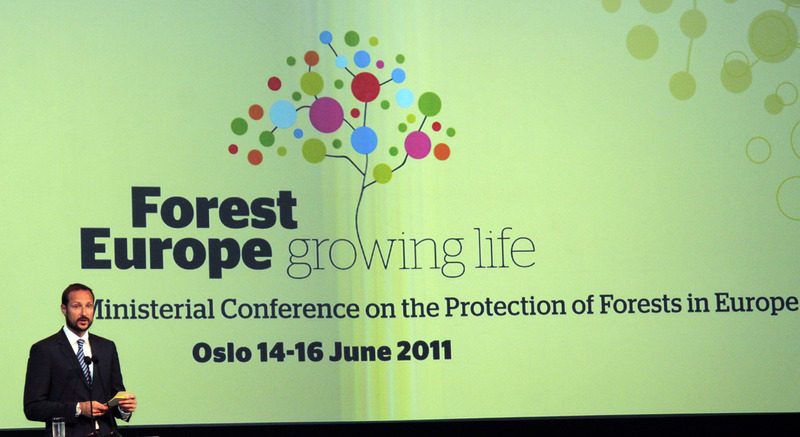 The Forest Europe Ministerial Conference opened today at the Radisson Blu Hotel in Oslo, Norway. 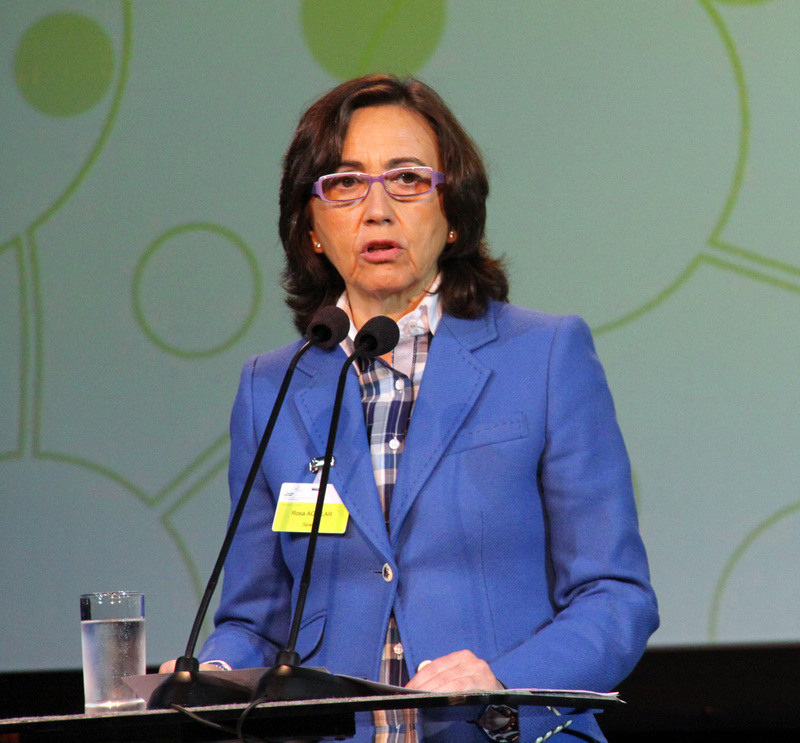 In attendance were ministers responsible for forests and high-level representatives of European countries and the European Community, as well as representatives of observer countries and organizations. HRH Crown Prince Haakon of Norway opened the conference and welcomed participants to Norway. 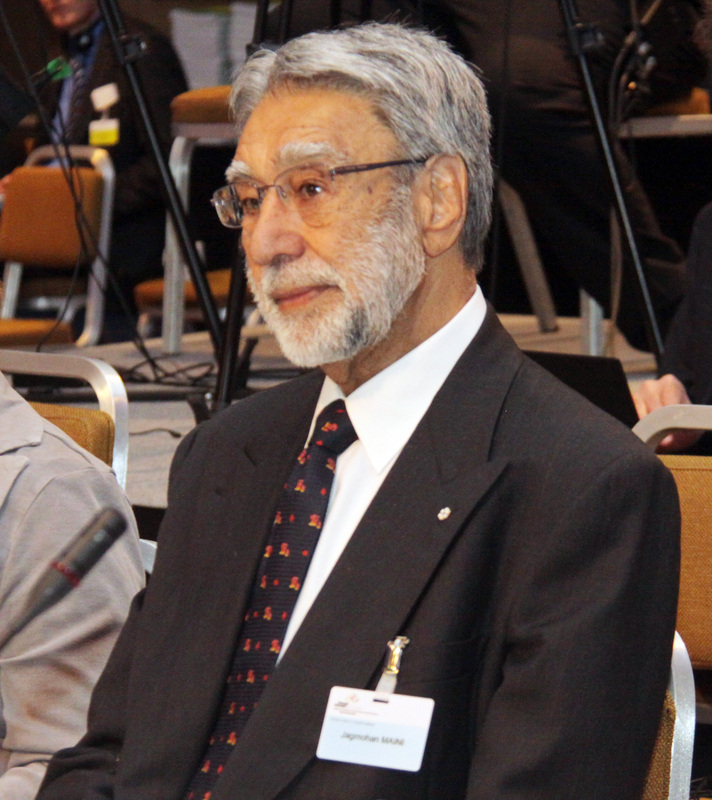 He noted the role forests play in society, economy, biodiversity, and climate change and stressed cooperation and good governance for sustainable forest management (SFM). 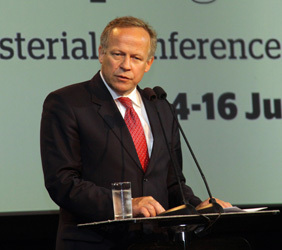 Dag Terje Andersen, President of the Norwegian Parliament, called for investments in forests as a renewable resource. 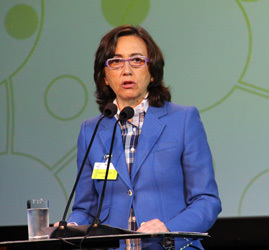 Delegates heard keynote addresses from Victor Nikolayevich Maslyakov, Head of Federal Forestry Agency, Russian Federation, and Silva Rodriguez, Director-General, European Commission, who discussed continuing forest-related challenges in the Russian Federation and Europe, respectively. 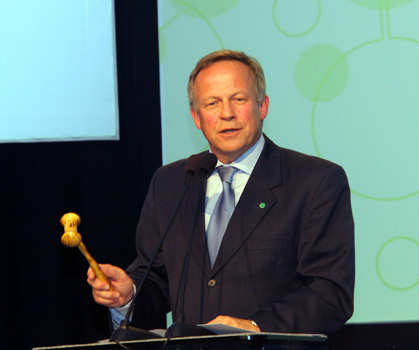 After the opening ceremonies, delegates participated in a thematic session entitled "Europe's forests – challenges and opportunities.” Christopher Prins, international forest expert, presented the report “State of Europe’s Forests 2011,” highlighting progress made and remaining challenges in implementing SFM in Europe. Delegates then participated in a panel debate on European forests in a global perspective, where they heard statements from representatives of Major Groups and other panelists. 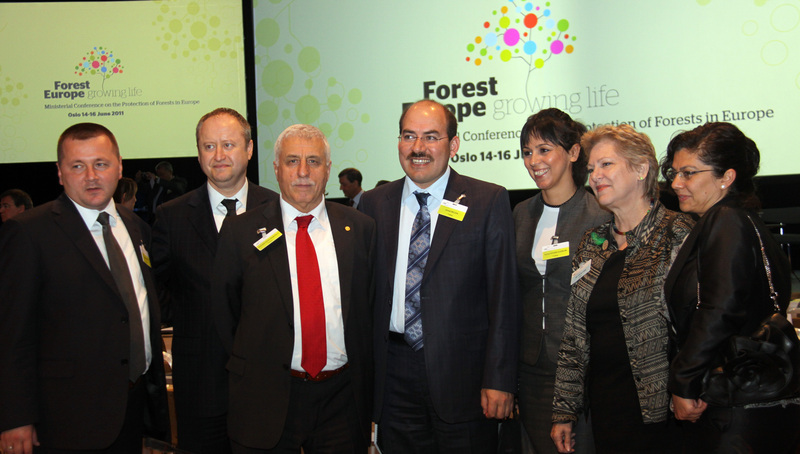 Much of the discussion focused on forests for bioenergy and the role of forests in the green economy. 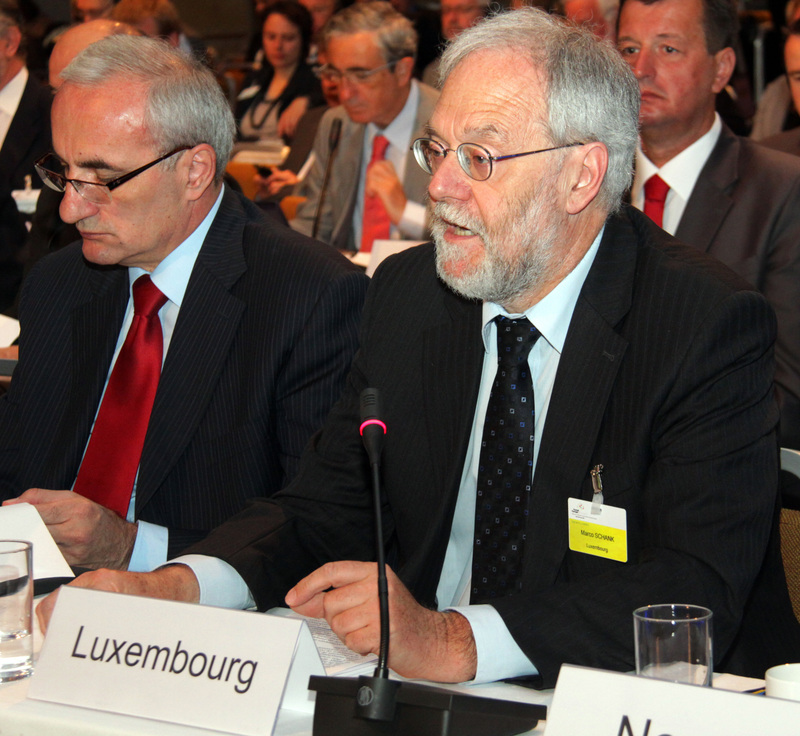 In the afternoon, delegates heard statements from signatory countries during a Ministerial Roundtable. 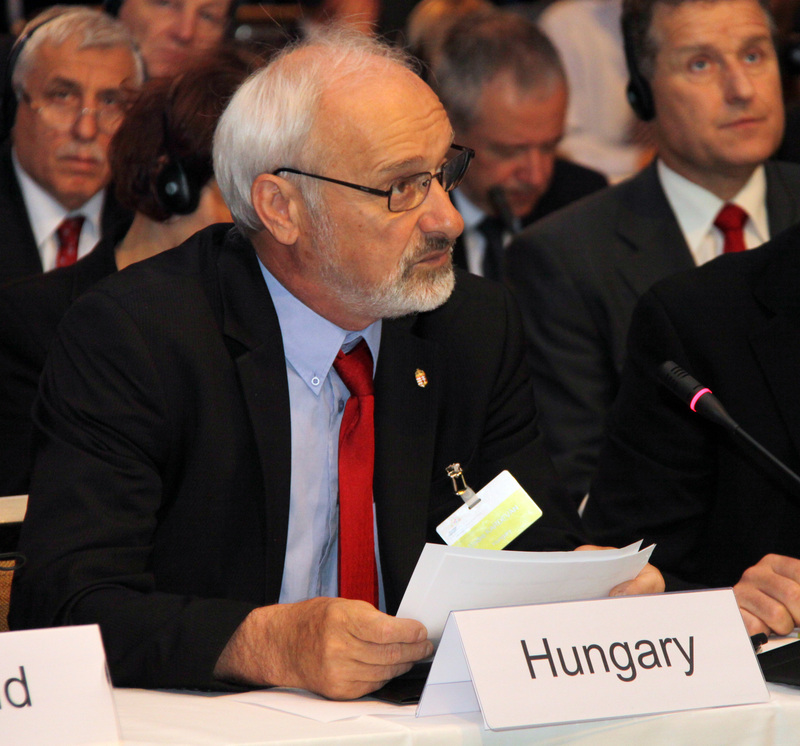 Ministers expressed their support for the Oslo Ministerial Mandate for Negotiating a Legally Binding Agreement on Forests in Europe, as well as the Oslo Ministerial Declaration: European Forests 2020, which describes a vision, goals and targets for European forests. 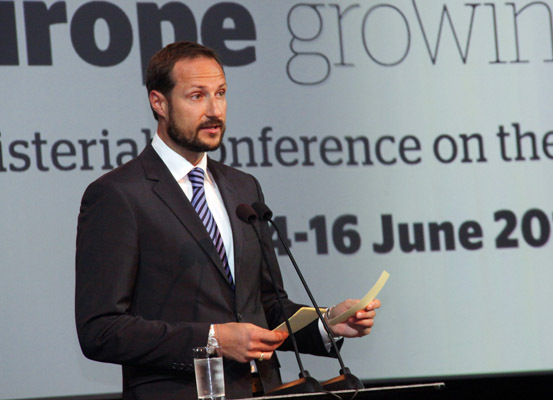 HRH Crown Prince Haakon of Norway gave his opening address and officially opened the meeting. 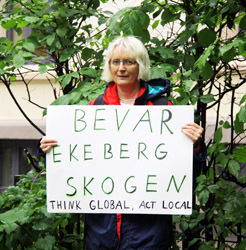 Lone protester calling to preserve the forests around Oslo. Jan McAlpine, UNFF, with the Turkish delegation. L-R: Ismail Belen and Sibel Silici, Turkey, at the Forest Europe's Turkish booth.